I have decided to join in the nail art fun being generated by Nail Polish Canada, with their second annual Holiday Nail Art Challenge. There is still time to sign up and join in for either this week, or for the next two weeks. Plus there are some awesome prizes (if you are in the USA or Canada - or I assume if you have a mule who can ship to you). The first weeks theme is Snow. I love having a theme to work with, it makes it so much easier for me to think of something to do (or more likely, to google image search and come up with something). Let's look at my nail art. I started with a clean white base for my canvas, I then did a gradient with Ulta3 Spring Shower at the top and bottom, and Picture Polish Wisteria in the middle. I searched through all my stamping plates to find a range of snowflake designs and stamped about 6 different designs and sizes across only the top of my nails. I also stamped the trees and the reindeer. The small trees were from a full nail image of little trees on Winstonia W120, and they were all stamped individually. To finish it off, I applied a layer of top coat and then carefully sprinkled a tiny amount of craft embossing powder. It was the perfect size to create a textured show appearance. Now like I said above, I love having a theme to work with. When I'm stuck for ideas, the first thing I do is a google image search. 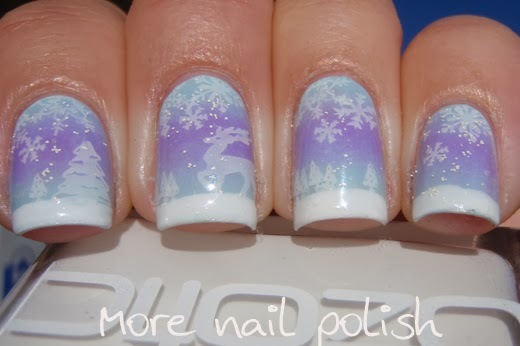 This time I googled "snow scene", and as I was scrolling through the results, I found an image that screamed out to me to paint it on my nails. See how easy this is to translate onto your nails? :) Nail art is so fun when the right inspiration hits you. If you want to see some great nail art you should check out the other entries. You can also vote for your favourite. If your favourite happens to be mine, thank you for the vote! You guys rock! I love this <3 especially how soft and snowy it looks. Beautiful! Like all others above, I LOVE how soft this looks, almost peaceful! I can see this design being on an expensive Christmas card (you know the kind, with the cut outs, loads of glitter & ect) . 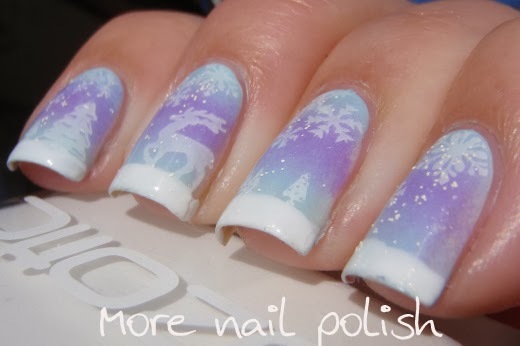 Your gradient is flawless, well... everything about this mani is actually! Amazing job! 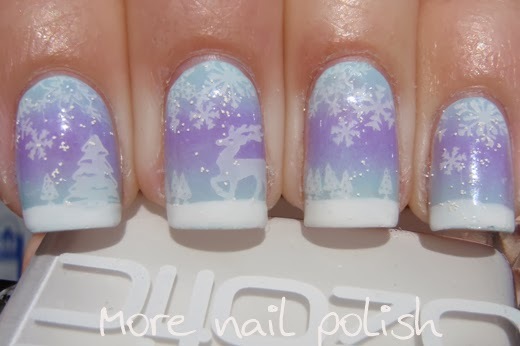 So beautiful, I love snow on nails. Wow, this looks so perfect! I love it! This is just stunning! I tossed my embossing power last spring after not having used it in 10 yrs! What an interesting way to use it and not get the large pieces that are in textured polishes. This is gorgeous and so mesmerising. In love with this design! I love that your stamping color is softer than a standard white stamping polish. What did you use? Thank you. It's actually Konad white, but it's the very last dregs of the bottle and it has been thinned a bit to get it out. Wow this is stunning and I am pinning to my inspiration board right now! WOOOOW That is stunning!!!! AMAZING job!